The largest inventory of restoration Firebird & Trans Am parts in the business; exhaust to interior, Trans Am body parts to tires and more. 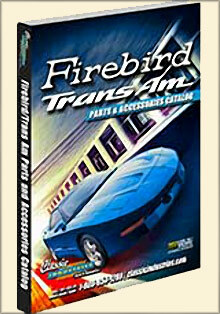 Enter the Promo Code - C73FB - at checkout on the Firebird TransAm Parts by Classic Industries website. Firebird & Trans Am parts catalog - Whether you own a 1st, 2nd, 3rd or 4th generation Trans Am Firebird, you need a copy of Classic Industries' Trans Am parts catalog sitting on your dashboard. Featuring thousands of quality Trans Am parts from Trans Am exhaust to interior and body parts, shop with ease by your Trans Am model's year from 1969 to 2002, product name or part number from America's favorite source for Firebird parts. Trans Am body parts - Classic Industries' Firebird Trans Am parts catalog helps keep the body of your Firebird Trans Am looking shiny and new with a wide range of body components from bumpers and fenders to door components, rear spoilers, body panels, exterior styling parts, mirrors, hood and trunk components and other Trans Am body parts that are essential for refurbishing any Pontiac Firebird Trans Am. Trans Am performance parts - Improve and/or maintain your Trans Am's performance with a solid selection of Trans Am parts that will breathe new life into your classic car engine whether it's a decade old or pushing forty. Discover a revved up range covering parts for Trans Am engines, steering, suspension, brakes, ignition, Trans Am exhaust, electrical and wiring components and other high Trans Am performance parts from the Classic Industries Trans Am parts catalog. Trans Am interior parts and exterior - From small details to big wheels and tires, you'll find all of the interior and exterior TransAm body parts your restoration is calling for including console and dashboard components, AC and heater parts, exterior trim, audio and security accessories, interior lighting, emblems and decals, exterior trim and more. Since the early seventies, Classic Industries has grown into one of the most widely known leaders in restoration car parts and accessories, featuring an overwhelming inventory of Firebird Trans Am performance and body parts. Shop the Trans Am parts catalog for a supreme selection of Firebird parts that will enhance both the look and performance of your vehicle.